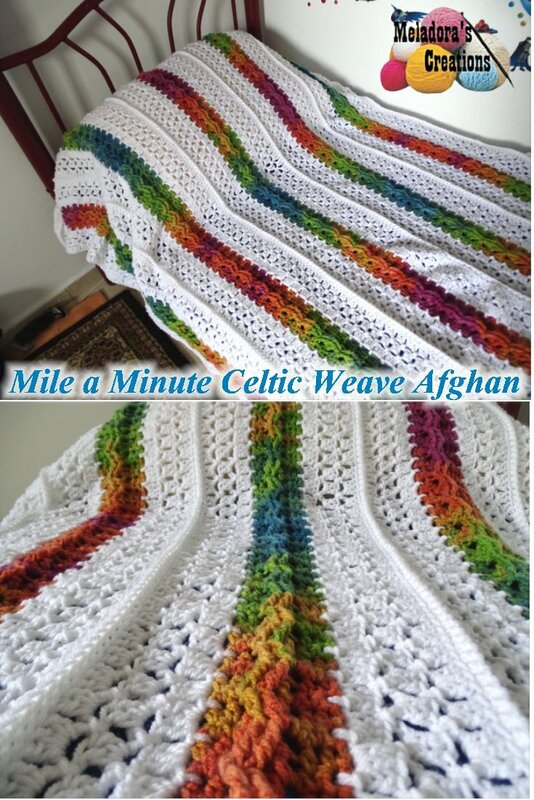 This Free Crochet pattern teaches you to make a Mile a minute afghan using the Celtic Weave and clusters. 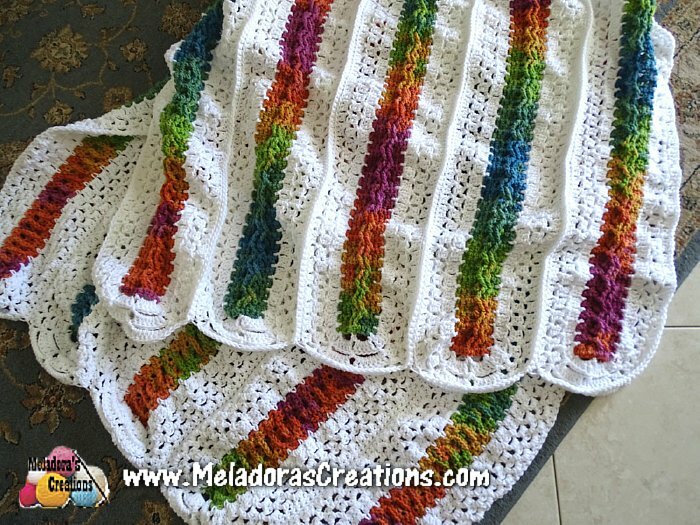 This is the afghan I use from year to year. It’s very warm and beautiful! 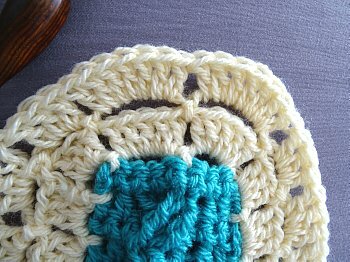 It’s a great afghan to make when it’s warm outside because it’s done in pieces so you never have to much on your lap at the same time. 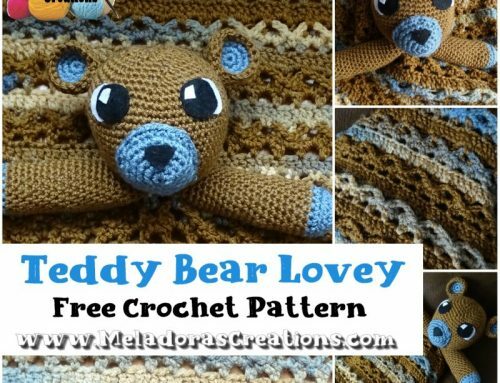 Hope you enjoy this pattern as much as I do. 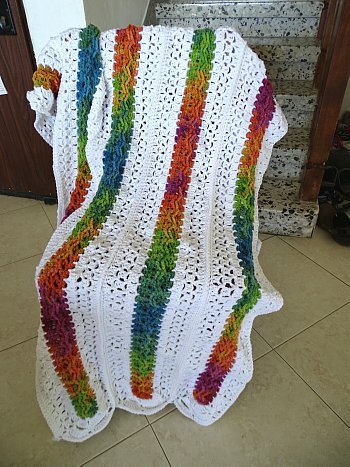 This afghan is made to fit a twin / full size bed. 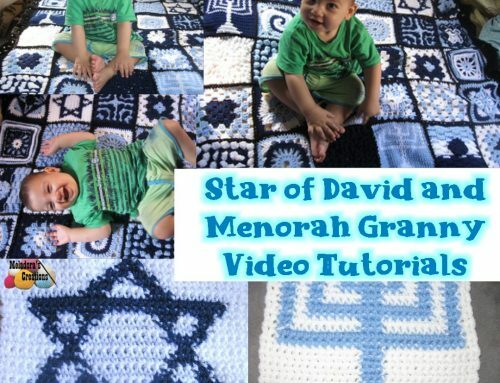 But you can make the strips as long or as short as you want. 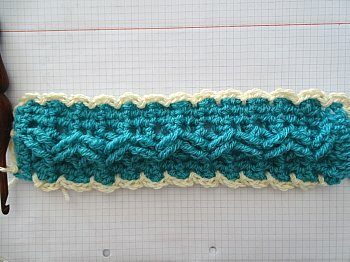 Would make a nice baby blanket or pillow. 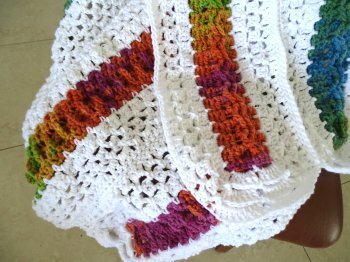 NOTE: This afghan is worked in strips and pattern begins with the center of the strip show in variegated colors in the display picture. 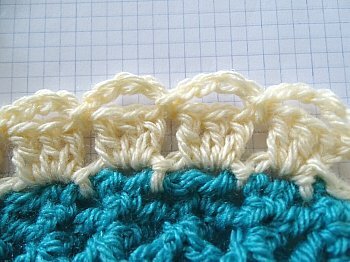 The center stripe is worked back and forth in rows. The outside of the strip is worked in rounds. 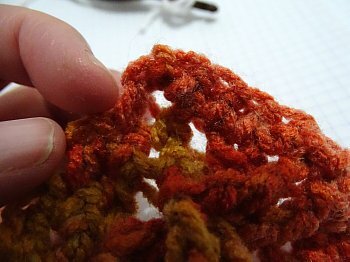 HDC in first two stitches, then skip two stitches and TRC on the post of the 5th and 6th Dc. Then going in from behind the TRC’s that you just did, back up and do TRC in the two dc’s that you skipped which were the 3rd and 4th Dc. 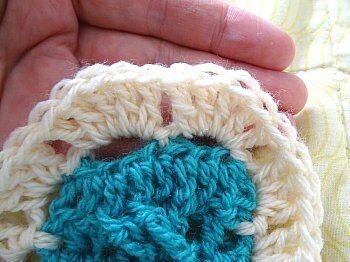 Do this by pulling the stitch upward before working your stitch on it. Use pictures below to help you understand. 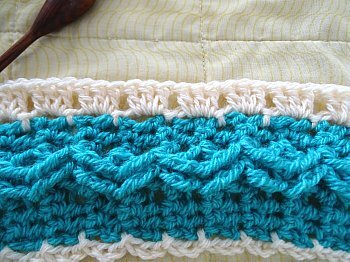 Repeat for the row, HDC in last two stitches. HDC on the first 2 stitches. Then TRC on the post of the next two TRC’s, then back up and TRC on the two TRC’s. 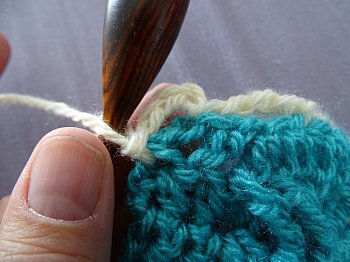 Do this by pulling the Stitches forward. See picture below. 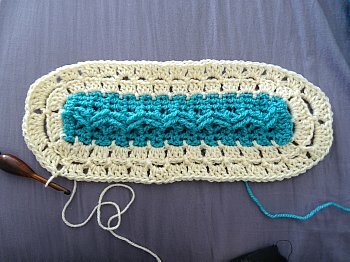 Continue this for the row and ch 1 and turn. 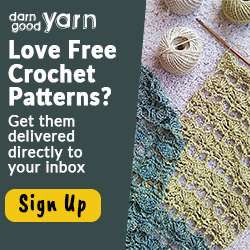 Repeat rows 2 – 5 until desired size is reached. NOTE: Be sure to end your strip on after a SC row. 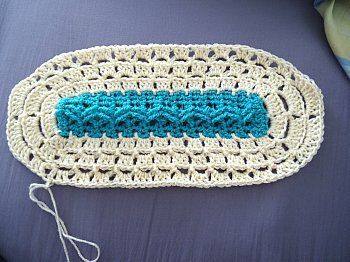 Now grab up the color you want to use for the outside of the strip. Attach your new color in the top left corner under the first DC. We will be working down the side of the strip first. * ch 3 skip 2 sts and sl st in next st * Repeat for the whole side until you reach the top / bottom of the strip. 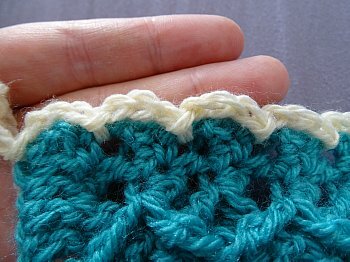 When you reach the top / bottom of the strip, you want to chain 5, skip 2, ch 5 skip 3 slip stitching in the very last stitch. Then for the corner make sure you sl st in the bottom of the DC to create a loop for each corner. Do this for all corners of the strip. 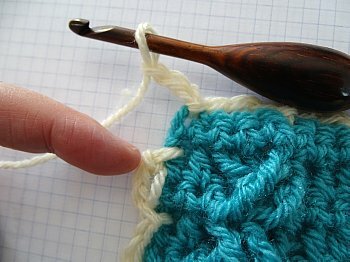 When you reach the beginning again, make sure to create this same corner loop for the beginning as well. Slip st where I’m showing you here in this picture below. sl st into first ch 3 space then ch 3 and DC 2 in this space. DC 3 in the following ch 3 space and in all ch 3 spaces down the sides. NOTE: If it’s ruffling some it’s okay, you can fix this on round 4 round. When you reach the top / bottom of the strip you want to DC 5 in the two ch 5 spaces at the top. Sl st in the top of the beg ch 3 to end round. Ch 4 and sl st int the space between the DC clusters from the last round. When you reach the Top / Bottom ends of the strip, you want to ch 7 and sl st in between. NOTE PATTERN CHANGES SLIGHTLY HERE + TIP! 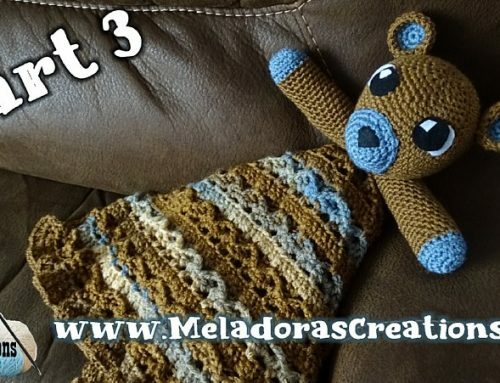 I have tried this pattern with yarn that ranged from the thinner to the thicker side of worsted weight 4 ply / 10 ply AU and I have found these alterations in the pattern will help your strips stay flatter. 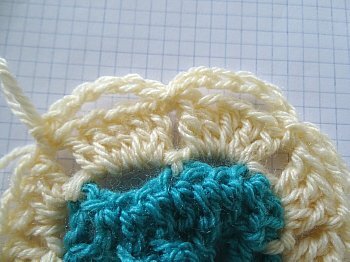 So depending on what size your yarn is leaning toward, thinner or thicker, follow the pattern as needed, but it is by no means set in stone. Once your start your second round of 3 DC”s and if it’s not working for you, feel free to stop and make adjustments to the amount of DC’s your adding in the ch spaces. 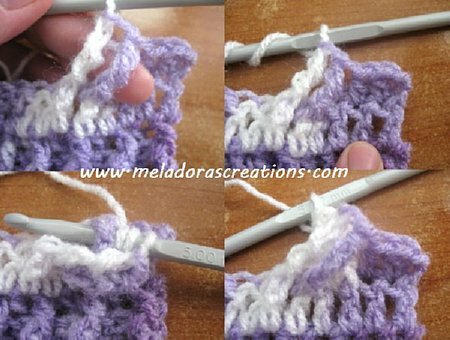 I had to rip mine out several times until I found the correct combination that worked with the way I crochet and the yarn I was using, but once you have got the right combination, the rest of the strips will go fast and fun! Sl st into first ch 4 space then ch 3 and DC 2 in this space. DC 3 in the following ch 4 space and in all ch 4 spaces down the sides. Recommendation to try first, make changes if you need. sl st into first ch 4 space then ch 3 and DC 1 in this space. DC 2 in the following ch 4 space and in all ch 4 spaces down the sides. When you reach the top / bottom of the strip you want to DC 7 in the 2 ch 7 spaces at the top. Sl st in beg ch 3 to end round. Ch 4 and sl st int the space between the DC clusters from the last round. On the top / bottom of strip ch 9.
sl st into first ch 4 space then ch 3 and DC 1 in this space. DC 3 in the following ch 4 space and then keep alternating as s, DC 2 in next space, DC 3 in following. When you reach the top / bottom of the strip you want to DC 9 in the 2 ch 9 spaces at the top. Sl st in the beg ch 3 space and cut your yarn. 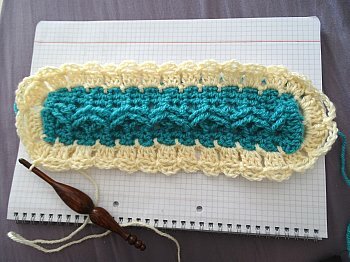 I used the Single Crochet Method of having both pieces with the wrong sides of the strips facing each other, good sides facing out, and starting in the first stitch on the side, insert your hook into it and to it’s equal on the other strip your sewing together and do a single crochet. 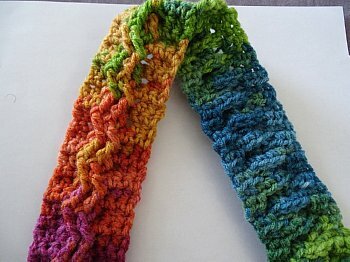 Single crochet to sew them together until you reach the last stitch on the side. Don’t sewn on the top / bottom of the strip. 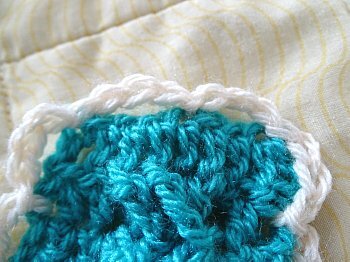 Sewing this way leaves a nice ridge of texture in between the pieces sewn.